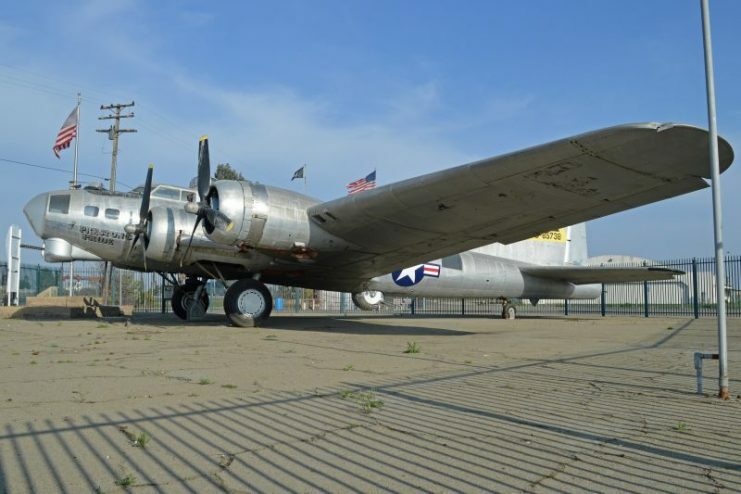 Volunteers in Tulare, California, are working to complete the restoration of “Preston’s Pride,” a World War II Boeing B-17 bomber. The plane has been sitting at Mefford Field alongside Highway 99 for decades. 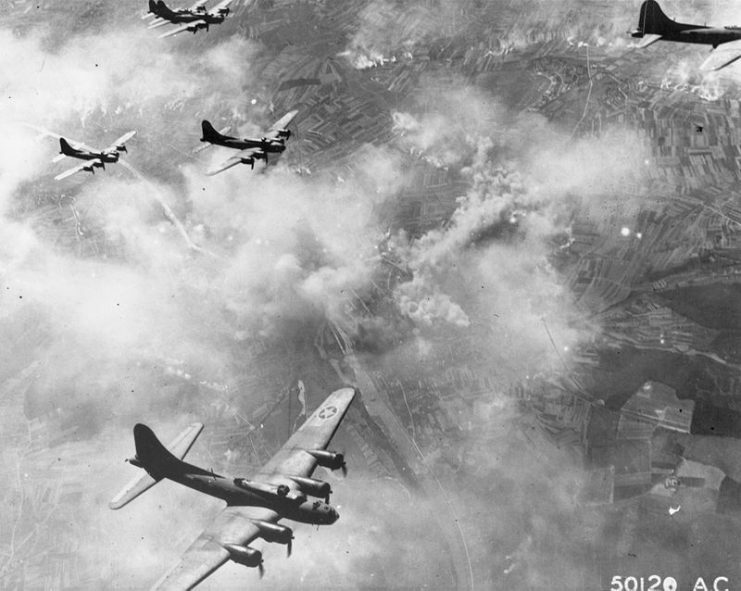 Formation of B-17’s over Schweinfurt, Germany. The four-engine “Flying Fortress” is an iconic plane from WWII. Known for its reliability, endurance, and resilience in battle, General Carl Spaatz considered the B-17 as being key to winning the war. It was capable of sustaining significant damage and still return its crews back home. It was armed with 13 machine guns for defense and was referred to as a “flying porcupine” by German fighter pilots assigned to bring the B-17 down. 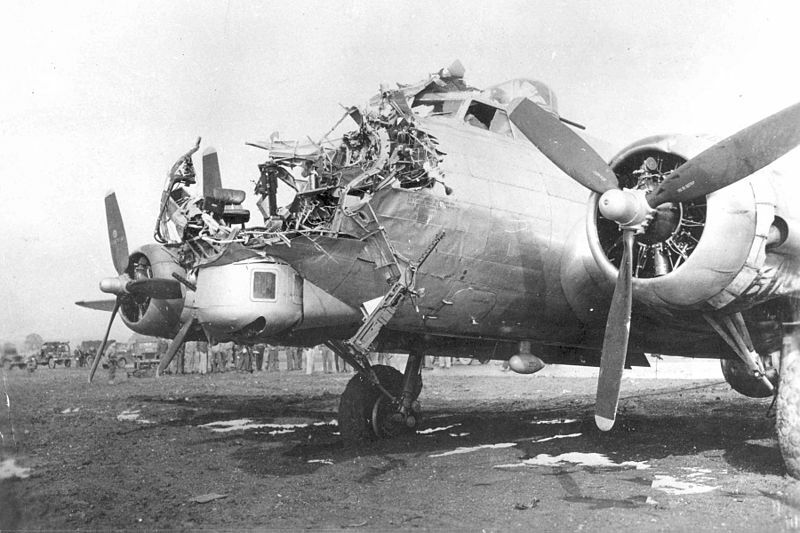 Damaged B-17 following a raid on Cologne. To get the project off the ground, the organization B-17 Archaeology has rounded up volunteers from across the country to come to Mefford Field and try to save this plane. Completed on May 18, 1945, “Preston’s Pride” did not get a chance to see action in WWII but it played an important part in the period after the war: It was the “mother ship” that remotely controlled twelve other B-17s in a 1946 experiment involving nuclear weapons. The B-17s tested the fallout from nuclear explosions above a fleet of ships in the Marshall Islands. The plane became a landmark as it sat at Mefford Field beside Highway 99. It was dedicated as a memorial to the residents of Tulare County that had served in WWII. 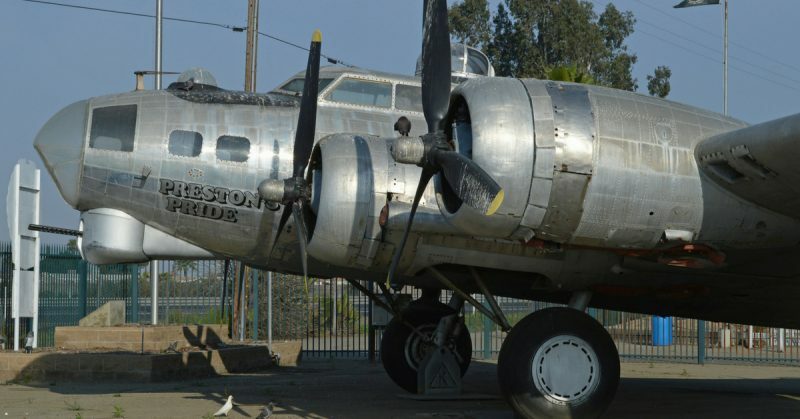 Over the course of time, the weather, vandals, and three separate car accidents have damaged “Preston’s Pride.” The iconic plane was in need of a makeover. The goal of the group is not to get the plane back to flying condition. Instead, they are working to restore its appearance. There is quite a bit of work needed. They will polish the metal and restore the original paint scheme it had when it flew in the nuclear tests. They will also make some structural repairs. So far, the work has cost $90,000. They expect that price to rise to $120,000 before they are done. All of the money spent on the plane was raised through donations and the sale of merchandise like commemorative shirts and hats. Many businesses and history buffs have donated items, time, and effort to complete the restoration. Stathatos said that it will still be called “Preston’s Pride” but now it will look like new and be a fitting tribute to the atomic testing it was part of. 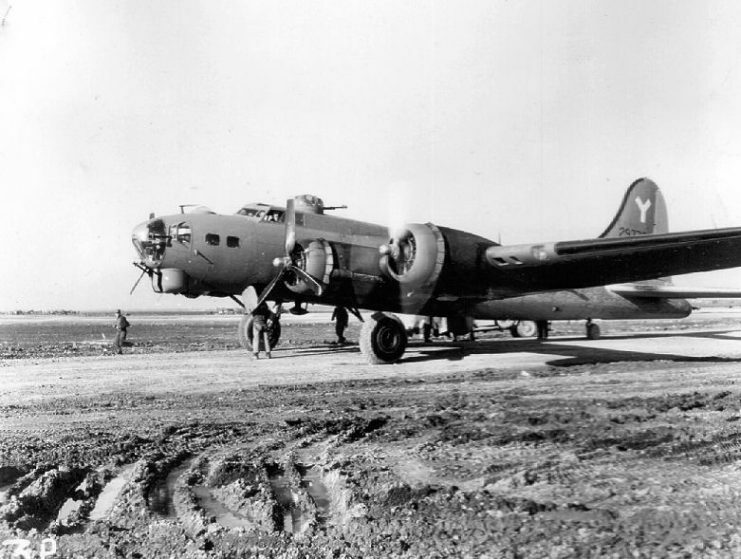 General Preston worked to obtain the B-17 on permanent loan from the National Museum of the United States Air Force. He then flew the plane to Tulare for her last flight and final posting. General Maurice Arthur “Mo” Preston. Preston served in the USAF until 1968. He logged 45 missions in B-17’s over Europe during WWII including leading one of the now famous Schweinfurt Raids in April, 1943. 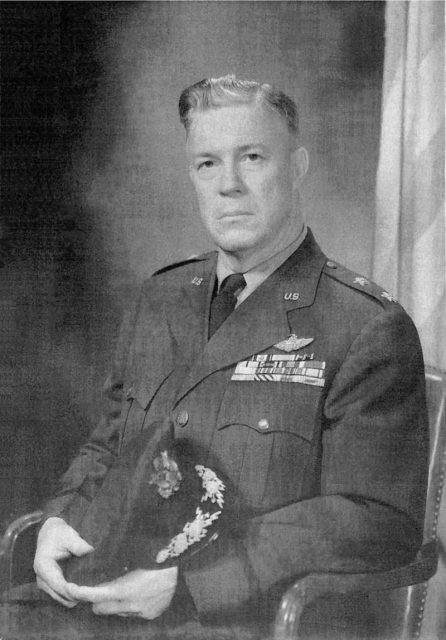 During his extensive career, he served as the commander of the Tactical Air Command’s 19th Air Force (from 1960 to 1963), Commander US Forces Japan (from 1963 to 1966) and Commander USAF Europe (from 1966 to 1968). Preston was born in Weed, California and graduated from Tulare High School. He later attended and graduated from West Point. He died in 1983 at the age of 70. “Preston’s Pride” sits at Mefford Field which was used as a US Army Air Corps training base during WWII. Basic pilot training took place there for a few months until training was moved to Rankin Field following construction.